I was asked to make two cards for the same person. The first one is made with a white base card with paper from Papermania Capsule Collection and cuttlebug corners. 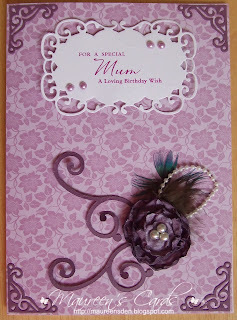 The sentiment was printed direct from the pc and cut with a Marianne Creatable Die and I added some gems. The flower was made by Lee (aka CraftyLoops) and the flourishes are a quikcutz die. The second card is made with a white base card with backing paper from Papermaine Signature Collection. The image is from a Debbie Moore 'Funky Divas' CD and is layered onto white card cut with Nesties. The Ribbon, Card Candy, sentiment and Peel off Borders are all from my stash. They are both beautiful cards Maureen. Great and so elegant cards. I just love both of these cards! Very pretty, lovely colours and ribbon and everything.